The entire temple premises (left) were lit up with thousands of sparkling lights and chant of Aum Namah Shivaya filled the surrounding with serenity. HOUSTON: According to the Hindu calendar, Magha Krishna Chaturdashi is known for the celebration of Maha Shivratri. This year, March 4, 2019, Monday, was that auspicious day. Typically, a work day would mean less opportunity for working families to celebrate traditional Hindu festivities. 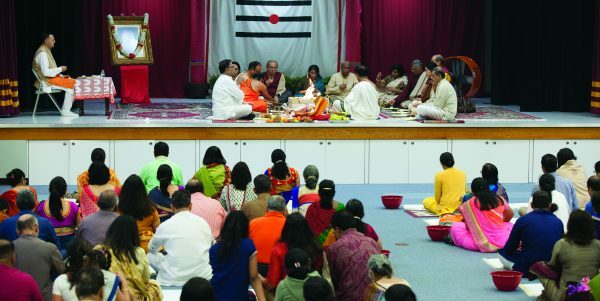 However, this year, Chinmaya Mission Houston presented unique and thoughtful means for devotees all over the greater Houston area to take part in this celebration. The two-day celebration started with Maha Mrutyunjaya Homa at Smriti Hall on Saturday March 2, 2019. The Maha Mrutyunjaya Homa is performed for spiritual and physical wellbeing of all. Shree Ganesha Sathyanarayana, chief priest at the Saumyakasi Sivalaya, CMH, conducted the homa in traditional Vedic style as Yajamans of the homa offered oblations to the holy fire. All attendees were also able to offer oblations using items provided to them as the serene chanting of Maha Mrutyunjaya Mantra filled the hall. Towards the end of the ceremony, volunteers collected the offerings from attendees and offered them into the homa-fire during Poornahuti. It is this very aspect of inclusiveness that made this homa unique. On Monday, the actual day of Maha Shivaratri, the temple team of Saumyakasi Sivalaya arranged day-long events. The basement of the Sivalaya was modeled like Kailas, the holy abode of God Shiva. The day started with Mahanyasa Purvaka Ekadasha Rudrabhisekam. Mahanyasa is performed for purification of mind and body. Rudram is an auspicious Vedic hymn elaborating the glory of God Shiva. During Rudrabhisekam, the Shivalinga, the symbolic representation of God Shiva is offered milk, water, honey, holy ash, fragrant water etc. The Rudrabhishekam was followed by prayers and Aarti. This year, Chinmaya Mission offered a seva where devotees could perform Rudrabhishekam either themselves or with their families. On Monday, the Smriti Hall stage held a beautifully crafted replica of Kedarnaath temple that was set up on stage along with the idol of Lord Shiva and a Shivalinga. Devotees participating in Rudrabhishekam were provided with sphatika shivalinga and all items necessary for performing the abhisheka as guided by the priest. After the abhisheka, devotees carried sphatika shivalingam home so they could worship it daily. The Smriti Hall stage was setup as a Kedarnaath Temple. The priest, Sri Somayaji Bhattar, led Rudrabhishekam puja. Photos by Rajesh Thatte, Jayesh Mistry. In the evening, even as the cold weather had the touch of Mt.Kailas, thousands of devotees flocked the temple premises. The young and old performed Kshirabhishekam (offering of milk) on the Shivalinga of Lord Shiva in the temple basement before visiting the main sanctum where Laghunyasa Purvaka Ekadasha Rudrabhisekam was performed. The entire temple was lit up with thousands of sparkling lights and the chant of Om Namah Shivaya filled the surrounding with serenity. After the night’s celebrations, an hour-long meditation session began at 10:30 PM which concluded with the midnight Aarti. One must attend this special meditation session to fully recognize its immense impact on an individual! As always, events of this magnitude are possible only because of hundreds of volunteers who dedicate their time and efforts selflessly for such auspicious celebrations.